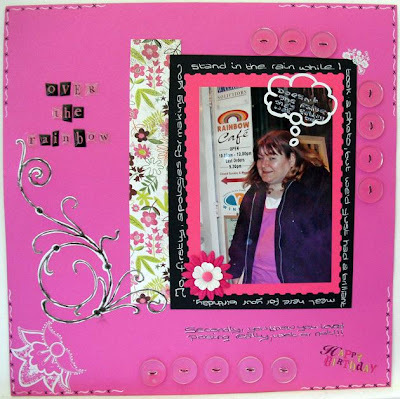 Write in white is Shimelle's latest Scrap Like You Mean It challenge on UKScrappers. Here's my LO. Photo of my youngest sister after we'd been to the Rainbow vegetarian restaurant for her birthday. The large swirl and thought bubble were templates from UKS members Lucille and Dan and cut on my ROBO. The writing in the thought bubble is "doesn't she realise she's getting wet too?"